You don’t find too many bean sprout recipes around, so I was really happy to be sent this one. 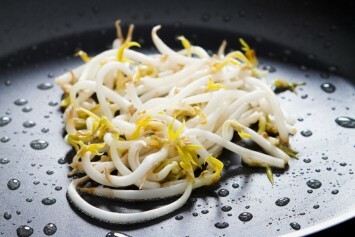 Bean sprouts are so low in calories, but surprisingly high in nutrients. Heat the oil in a large skillet or wok on medium heat. Add the mushrooms and garlic. Cook until the mushrooms have released their juices. Add the sprouts, ginger and green onions. Cook and stir until the sprouts are heated through and coated with the oil mixture. Add the walnuts and soy sauce. Cook and stir for about 30 seconds. The walnuts in this recipe are a nutritional bonus. They are an excellent source of omega-3 fatty acids, also found in salmon. Our body cannot produce Omega-3 fatty acid and we tend to get far too little of it in our diets. Walnuts are also a very good source of mono unsaturated fats, the same fat found in healthy olive oil. The only way I can think of to make this recipe even healthier is to cut down on the amount of oil you use to cook the bean sprouts and to use a good quality cooking oil. Better yet, have you tried coconut oil yet? It’s fabulous tasting with just a hint of coconut flavor AND tremendously healthy for us. Make sure it is virgin coconut oil, which is actually solid at room temperature. For all of the reasons mentioned above this is a wonderful diabetes recipe. It is low carb and full of healthy fats in the walnuts. This light Asian flavored side dish is not just a great accompaniment for Chinese dishes. I would serve this with chicken breasts baked with soy sauce, or grilled beef. Stir fry bean sprouts are also great as part of a vegetarian meal. Try serving it with other Chinese vegetable recipes for a vegan or vegetarian feast. You will find more bean sprout recipes here.